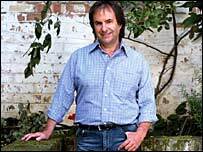 Singer Chris de Burgh has said he has healing hands which have "helped reduce pain" for people with injuries. He told of a golfer who had seriously hurt his leg in an accident, but who began walking again "within 20 minutes" of his form of "alternative therapy". "We all have the facilities within our hands to feel other people's pain spots," the Irish star told BBC One's Heaven and Earth programme. He said his musical work meant he was "connected very strongly" to his hands. "A guy I met one time - he'd hurt his leg badly in a golfing accident," the 57-year-old, whose hits include Lady in Red, said. "He was in serious pain, just below the knee, and I felt the area above had been traumatised. "I started feeling and I'd say within 20 minutes, he was walking again. It took away the pain." He went on: "I think the next day it was still there, throbbing away, it was nowhere as bad, but I have to stress - I think we all have this facility." He explained that he had a "spiritual side" and was "convinced we're surrounded by a strong force" which could be contacted through prayer. "Where people are desperate, I believe there is all-encompassing strength that we can find," De Burgh added.